Barbiturates are highly addictive medicines that cause sleepiness and relaxation. They act as central nervous system (CNS) depressants. They bind to the GABA receptors causing mild to severe sedation. However, because of their narrow therapeutic and toxic window, they are not used as much as they once were. Most importantly, there is a very small difference between a dose that causes sedation and a fatal dose. However, despite the many dangerous effects which come with barbiturates, people still abuse them. This is especially true in teenage circles. The reason for this mainly lies in the similarity between the effect of alcohol and barbiturates. Non-medical use of barbiturates includes a couple of areas; buying barbiturates on the streets without a prescription (which is illegal), having a prescription but using more than your doctor ordered or using medication prescribed to someone else. A 2014 study showed that 1% of the American population admitted to using barbiturates for nonmedical purposes. One percent may not seem like a lot but it’s actually 2,700,000 people. What is more concerning is the fact that those using barbiturates for nonmedical purposes are at a much higher risk of overdose. If the drug was not prescribed to them then they are not using it under medical supervision and may be less conscious of the risks. They also are more likely to mix barbiturates with other depressant drugs like heroin or alcohol. This creates a toxic mix, which may cost someone their life. Barbiturates are a group of drugs which doctors prescribe for anxiety and insomnia relief. At first, they saw a tremendous increase in medical use in the 1960s. However, due to their habit-forming properties barbiturates are no longer doctors’ first choice. Presently, there are still cases in which doctors prescribe barbiturates to achieve sedation. People who abuse this drug are mostly patients who initially get it from their doctors’ prescriptions. After a prolonged intake, they slowly become dependent on barbiturates and develop a tolerance. This is a very typical route to drug addiction. This is a critical point in Barbiturate use. It is because tolerance means the need for larger doses of the drug. As a result, this can be fatal. Barbiturate overdose happens when one takes more of the drug than instructed by their doctor. This can also happen when one self-medicates. Unfortunately, the line between the therapeutic and toxic effects is very thin. As a result, an increase in dosage, especially during self-medication is not a good idea. As with many drugs, overdose can happen accidentally. It is intentional only when one is trying to take their own life by ingesting a lethal dose of the medication. Using the drug longer than the proper period can also cause an overdose. This usually happens when a person has become addicted. Mixing it with other drugs and alcohol is extremely dangerous, as the drug reactions can be fatal. Unfortunately, in certain situations, users might not realize they are doing it. There are a number of other factors that can increase the possibility of an overdose. These include a person’s age, mental health issues, chronic illness, and physique. What are Barbiturate Overdose Statistics? Barbiturates have become somewhat obsolete in medical circles. However, their dangerous and often fatal side effects do not deter some users from taking this CNS depressant. According to statistics, barbiturates caused about 396 deaths in the last year alone. Some of these are due to the drug alone whereas, other cases are from bad reactions with other drugs, accidents, or mental illness. Furthermore, barbiturate phenobarbital resulted in 1,493 visits to the E.R. that same year despite the low prescription numbers. Barbiturates, as we’ve mentioned before, can be medically prescribed for legitimate reasons for anything from seizure disorders to headaches. Their use has significantly declined since the 1970’s and the discovery of a newer, safer form of hypnotic (sleep-inducing) and sedating anesthetic drugs, benzodiazepines. Though less common, barbiturates are still being used today. Addiction to Barbiturates often starts in people legally prescribed the drug. They grow dependent, continuing its use for longer than medically advised, or at a greater quantity. This presents a problem besides the obvious danger of addiction, seeing as this is a prescription drug and it cannot simply be bought at will. This leads to illegal purchasing of barbiturates on the streets, which presents a danger in itself because there is no way to regulate what users are purchasing. Another way people may become addicted is by borrowing medication from someone who has a legal prescription, which leads to a dependency. This again presents a problem as someone with no medical claim to the medication has become addicted, and must find other ways of obtaining it. In some situations, this may include stealing the medication from people who have a legal prescription. This is why it is very important to keep any prescription medication in a safe place. Barbiturates are addictive and with prolonged use, people can become dependant on the drug. Simply stopping taking barbiturates without medical supervision (withdrawal from barbiturates) can be life-threatening. As with any addiction and prolonged use, tolerance builds. This requires the user to consume larger amounts of the drug to achieve the same desired effect as before. Though tolerance to the mood-altering effects of the drug may happen quickly, tolerance to the lethal effects takes more time. This is where we find the danger of an unintentional barbiturate overdose. An addict may be at greater risk of a barbiturate overdose if he relapses after a period of abstinence. With prolonged use of the drug, our bodies build up a tolerance, requiring more and more of the substance to reach the desired effect. When someone who has built up a tolerance stops taking the drug and has a period of abstinence, that tolerance diminishes. If the addict then decides to return to using, the body will not be able to handle the same amount of the drug as it did at the peak of usage. This causes shock to the body and can lead to a barbiturate overdose. What to do if you witness a barbiturate overdose? If you suspect that someone has overdosed on barbiturates, you must call 911. Make sure to inform a medical professional about any other drugs the person might have ingested along with barbiturates. Usually, knowing the drugs the victim took can help doctors plan a proper treatment. Are there any pre-existing health conditions? What are the Complications of Barbiturate Overdose? Head injuries are very common in people who overdose on barbiturates. Due to lack of coordination, they often fall and hurt themselves. Head injuries can vary between mild and severe. Furthermore, they can even result in coma or death. Another serious complication of barbiturate overdose is pneumonia and non-cardiogenic pulmonary edema. As previously said, barbiturates act as a central nervous system depressant. Therefore, they might suppress breathing and the gag reflex. Consequently, it can cause aspiration of food and other particles into the lungs. Unfortunately, Barbiturates can also cause miscarriage because of their damaging effects on the fetus. When it comes to a prognosis of barbiturates overdose, it is far from bright. Presently, one in ten users dies from barbiturates overdose. In most cases, the cause of death is lung or heart failure. This is the reason why it is so important to act fast. Take the person who has overdosed to the emergency room so that they receive the proper medical attention immediately. The treatment of barbiturate overdose is highly supervised. All vital signs are carefully observed and the patient is monitored 24/7 due to various possible health problems. The first thing medical personnel check is breathing and swallowing ability. If a person can breathe and swallow on their own, simple monitoring is enough. 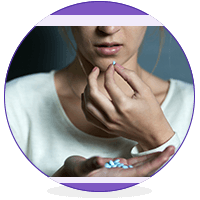 A priority for treatment of a barbiturate overdose is an accurate drug test, so that medical professionals know how to best handle the individual’s situation. This is especially vital because a majority of barbiturate overdoses are a result of a combination of drugs (often barbiturates and alcohol or barbiturates and opioids). These combinations are often a result of one of two groups of people. These are either novel drug users who do not know the effect this mix may have or, what is often more difficult to treat, experienced users who know exactly what they are trying to achieve. If the barbiturate overdose involved opioids, the patient may receive a drug called naloxone (Narcan) which acts as an antidote to opioid overdoses, quickly restoring breathing functions and consciousness. This often is life-saving. Furthermore, activated charcoal is inserted through the nasogastric tube to neutralize the toxin in the victim’s stomach. Because breathing is harder in this time, most cases require intubation. Unfortunately, there is no drug such as Narcan which would reverse the effects of a barbiturate overdose. If you, on the other hand, are using barbiturates non-medically the most reliable way to prevent a barbiturate overdose is to stop using immediately. However, quitting barbiturates without medical supervision can be incredibly dangerous because of some of the possible withdrawal symptoms, including dangerous mental states such as delirium and physical symptoms such as convulsions. Therefore, the best solution for those seeking to quit their barbiturate use is detox centers where one can safely come off the drug under medical supervision. This is the safest way to get the drug out of your system. After the initial detox, drug addiction treatment is a good next step. There, patients learn coping mechanisms and ways not to return to drugs in the future.